Siddharth runs his family’s educational institutes and Ruchi is a banker. 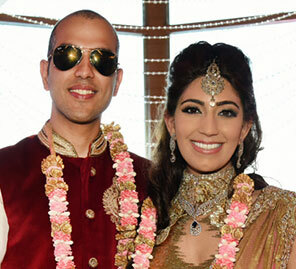 Here, Ruchi tells us how they met and about their grand wedding celebration in Udaipur. 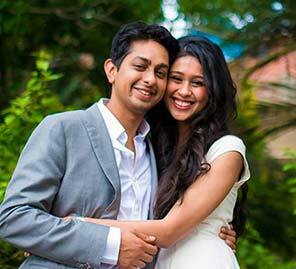 “Siddharth and I met through a common tutor a decade ago while we were in school. We got along well immediately and started dating after a year of friendship (though Siddharth did ask me out just 15 days after our first meeting). We had a 6-year long distance relationship when he went to the US and I went to Hyderabad to study. We survived on Siddharth’s secret visits from the US and our daily Skype chats. We managed the time difference as Siddharth used to take evening classes and sleep during the day to talk to me at night. “Siddharth's best friend is from Udaipur. Since the day Siddharth attended his wedding he’s been mesmerized by the place. So we had our hearts set on Udaipur. It’s magical, a place of palaces, lakes and grandeur. We had over 400 guests who we accommodated across 5 different properties - Udaivillas, Taj Lake Palace, The Leela Palace, Shiv Nivas Palace and Chunda Palace. We wanted our guests to experience royal luxury. 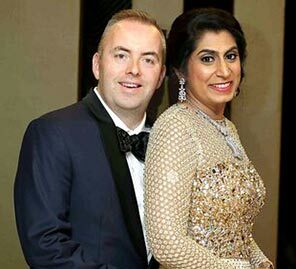 Each and every guest was flown in by private jet from three different cities and welcomed at the airport with traditional dancers, flowers and horse-drawn chariots." 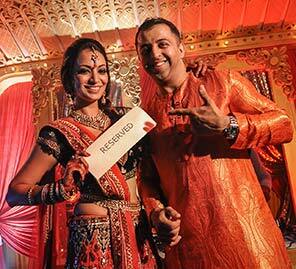 “We had a 3 day long celebration in Udaipur and 2 receptions in Bhopal. Our functions began with a Welcome Dinner on day one with Benny Dayal’s performance at Udaivillas. The décor was in hues of delicate peach and gold. Wedniksha organized a Buddha bar lounge for the after party and DJ Suketu rocked the night. This was the best night for our friends as they got to unwind and danced till the last beat. My peach gown for the cocktail dinner was by Papa Don’t Preach in Mumbai. I had a hard time looking for this one as I didn’t want anything Indo western. For the after party I wore a Sonaakshi Raaj outfit, which was very different from the usual dresses and gowns. Siddharth wore an Armani three-piece for the welcome dinner and for the after party he picked Canali. Sadly there aren't too many options for guys to choose from. On the morning of the second day, we had separate Mehndi ceremonies for the bride and groom and their respective families in their hotels. I picked a traditional poshaak from a local outlet in Udaipur that turned out to be a very good idea. Siddharth wore an outfit by Manish Malhotra. In the evening, we had the Sangeet and Shagun events at the famous Zenana Mehal. There was a performance by Indian singer & composer Mika Singh, and performances by our families as well. Both Siddharth and I wore Manish Malhotra from his Gloss collection. I’ve dreamed about these grand outfits since I was a little girl and finally got to wear one. This was a stunning grey lehenga. We all loved it at first sight and when we got it off the rack it fit me perfectly. Our haldi ceremony was performed on the morning of the following day. That evening, we had the baarat and pheras, followed by the reception at the most beautiful venue of Udaipur, the Jagmandir Palace. It looked stunning, beautifully lit with exquisite, vibrant red decor.